For foster carers Laura and Jake, caring for teenagers has given their family great memories to cherish. When their 16-year-old foster child Ben* came to stay, their own child Sean* had just turned eight months old. “We were so nervous taking another kid after having Sean that we said we wouldn’t care for teenagers anymore,’’ says Laura. “But Ben came along and we asked a million questions to make sure he was the right fit and our gamble paid off big time. He doesn’t see his family anymore so embraces us as his own. Now they are caring for Ben full time and have found that caring for a teenager is quite different to what they expected. It’s allowed them to share their life and introduce Ben to hobbies such as hiking and camping. It’s also opened up a new world and changed their perspective. “We love that we can learn new things from teens. Thanks to all the teens we’ve cared for we have learned to try cricket, fishing and running – things we wouldn’t be so involved in if it weren’t for the kids. According to Laura, some of the biggest myths are that teenagers are violent or aggressive, or that you can’t trust them. There have been moments when Laura and Jake they have had to teach kids how to deal with anger and they’ve managed to work it out by taking the dog for a walk or doing a boxing session or ripping apart cardboard boxes. 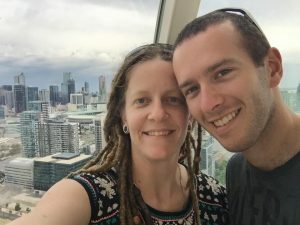 Laura and Jake used to phone Anglicare Victoria’s 24/7 on-call number for help a lot more than they do now because they have learnt more over time about how to better cope with issues. “The training is invaluable and I can really apply the therapeutic teaching approach to my teaching job also. It really is different parenting a foster kid but in a good way. It’s a more cooperative style of parenting.